A flat panel display and keyboard are available for use in troubleshooting sessions. Arlington meetings are free and open to the public. They are held on the 1st and 4th Wednesdays of the month. The Arlington General Meeting and Technology & PC Help Desk are held at Carlin Hall Community Center, 5711 So. 4th St, Arlington VA -- 1 1/2 blocks east of Carlin Springs Rd -- (Four blocks south of Arlington Blvd/Route 50). Meeting programs feature demonstrations and discussions by members and guest speakers. Special offers from vendors are often announced. Time is allocated at each meeting for attendees to ask questions and describe problems they are experiencing with their system's hardware or software. These are discussed and resolved by others present who may have had similar difficulties, or the necessary experience to help with answers to particular problems. Board of Directors meetings are generally held on the 3rd Monday of the month at Carlin Hall. In the event of a change in the newsletter printing or publication schedule, this could change, and the meeting might be held on-line, via a conferencing tool. Check with an officer before attending a board meeting. 5711 4th Street S., Arlington, VA. Located South of Rt. 50 - Arlington Boulevard, and North of Bailey's Crossroads (the intersection of Columbia Pike and Rt. 7 - Leesburg Pike.) Carlin Hall is one and a half blocks east of Carlin Springs Road, which runs between Rt.50 and Columbia Pike. 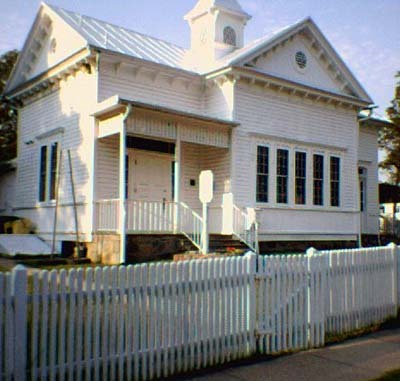 Carlin Hall is a white building on the north side of 4th Street that has the appearance of a one-room school house. It is surrounded by a white picket fence. Need specific directions? Try MapQuest . Select "Directions" for door-to-door driving directions. Enter 5711 4th St. S, Arlington, VA. 22204 as the destination. Member's Help & Participation Welcome!